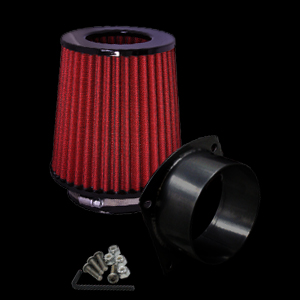 This Hot New Hi-Flow Bolt-On Big Mouth Air Filter System gives 1996-2009 Mustang 4.6L 2-Valve, 4.6L 3-Valve, 4.6L 4-Valve and 5.4 4-Valve Engines a Huge Boost in Airflow and Performance. This kit will take your 4.6L or 5.4L Mustang GT or Cobra and Increase Air-Flow and Velocity to enable a Normally Aspirated Engine to Gain from 7 to 15 Rear Wheel Horse Power and Supercharged or Blown Engines Gain from 15 to 35 Horsepower! This New Hi-Flow Bolt-On Big Mouth Air Filter System is the most economical upgrade package on the market and will perform neck and neck with just about any Air Intake Kit available today. This Kit replaces the stock restrictive air box and silencer assembly in front of the factory mass airflow meter. A Key Factor in Maximizing the Performance is keeping the filter directly in-line with the front of the air meter housing. Creating a Straight Shot will result in additional air speed and velocity by design alone. This setup is far Superior to a remote mount air intake kit that locates the air filter away from the mass airflow meter. Placing a bend in front of the mass airflow meter can have adverse effects on how the sensors reads the incoming air and potentially cause turbulence and affect performance and drivability. Lazer cut flange and tig welded in a billet fixture for a perfect fit every time. » Bolt on up to 7-15RWHP! 1996 1997 1998 1999 2000 2001 2002 2003 2004 2005 2006 2007 2008 2009 GT 5.4 4.6 v8 Mustang Steeda Roush & Saleen Vehicles. No one else can stack up to the bold clean styling of our aftermarket Billet dress ups, Street Strip & Racing Suspension & Performance Parts for your late model American Muscle Car!